Some may ask, “What is a digital nomad?” A digital nomad is making the absolute best out of telecommuting and getting to work wherever your laptop takes you. If you work in an office setting, and are able to work at home, it’s quite possible you could become a digital nomad. With a constant strain of email, Skype, and wifi readily available in most spots around the world, you can really work anywhere. However, I always see these beautiful pictures, of people drinking on the beach, reclined, working on their laptop. See below when I searched Google images for “digital nomads”. Here, I see vacation. As someone who has experience as a digital nomad, here are some eight truths to the practice. 1. No plug or wifi? No work! I’m really judging for an average telecommuting position, where you usually are working on your computer and are in need of the internet. If you have your own company or are an artist, then things may be different. But usually, you need wifi and an electrical plug to use your laptop. That’s why I get a little confused with the beach photos with digital nomads. Please tell me where there’s a beach with wifi! Also the implied alcoholic drinks in these photos… what? 2. Time management is key. If you’re working while traveling then you’ll need to on top of your game. You’ll need to wake up early get in your hours before you leave the hostel to see the sights. This takes discipline, since you’ll probably already have a crunched schedule if you’re traveling around and have a limited time in your destination. Getting up early to work or working late ensures you don’t take time away from the times main attractions are open. 3. You have to travel slower. Even working part-time, you have to realize that’s time you lose from being outside your hostel or your go-to wifi cafe. If you’re working full-time you’ll work that into how long you want to stay at a particular location. One location that could take two days to see could turn into five days if you have to put in work hours as well. 4. Staying organized is so important. You’re now working with time differences from your home office, and you’re nomadic work life keeps you bouncing around. Keeping a small notebook planner well organized with your notes and schedule will help more than you’ll ever know. 5. You have to work hard. You want to prove that you deserve the privilege to work remotely. Work hard and get your work done. Put on your headphones and put in those hours like you would in the office. It can be harder abroad with all the distractions, especially if you’re a backpacker staying in hostels, since then there’s not a lot of alone space. The common area may seem like great to work, but as a solo traveler you’re automatically approachable. Other hostelers won’t assume you’re working. Unless you get up early while everyone is snoozing, sometimes it’s best to just stay in your bed area getting your work done there. 6. The airport will be your best friend. There’s wifi and plugs at most airports, and you’ll need to get there early anyways. With food everywhere, you can grab some fries from Burger King and set up shop at a table and get in a good amount of hours. This is really good for those layovers where there isn’t enough time to see the sites, but it’s still a decently long layover. 7. A lot of people can do this. 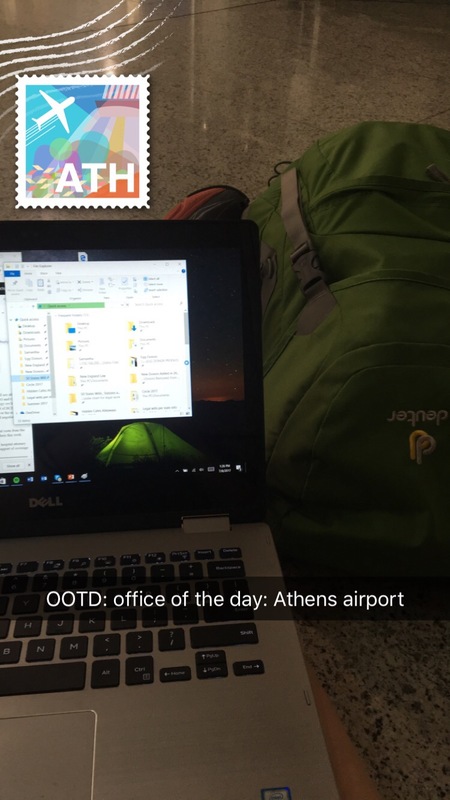 Having an office job is a privilege, but working on a computer means you likely can do it anywhere. If traveling is your passion, then start looking for jobs where they offer for you to “telecommute” or for you to “work remotely”. 8. It really is as good as it sounds. If you’re able to focus and are great with time management, then it really is an ideal work situation. Sometimes living or traveling abroad can be cheaper than paying rent in an expensive city (Boston, New York City, San Francisco, ect.). You get the freedom and mobility to see the world. And I get some pretty cool “offices” even if it’s just hostel common areas. The featured photo was my totally zen place in Budapest, Hungary: Shantee Guest House. The photo below was in Santorini, Greece: Caveland. While it’s not a vacation where you can drink on the beach, being able to work poolside with some chips on the side is a pretty great gig. I, personally, have been blessed with the ability to work remotely as a legal intern and in marketing at a family building agency. I work at an LGBT+ surrogacy and egg donation agency and law firm. I work full-time in the summer and part-time remotely during the school year while pursuing my Juris Doctorate. I was able to work while doing study abroad in Germany, and while doing a summer program in Malta. Just during my last study abroad trip, I was able to travel on the weekends and before/after the program. This allowed me to work abroad in eight countries over the course of a month, making a living while following my passion of experiencing new cultures. I’m so grateful for the opportunity to do this, and I hope this post helps others think about the possibility of becoming a digital nomad! I really enjoy reading your blog post. It was informative and realistic; which can sometimes be hard to convey to the audience when you want to want to live the digital nomad, make sense? Hopefully, lol. Anyways, I have always had an interest in traveling and working at the same time. With the tips you have provided it helps put into perspective how to actually live this lifestyle while working. I wrote a article from the standpoint of want to do it but not having time or resources as of yet. Thank you for sharing this wonderful information. It will help future researcher become more informed. Living in one place for a few months gives me the best balance of productivity and novelty, as a digital nomad. I like having a gym and sport to train in (surfing or freediving) and enough time to get to know an area, meet a few people and for it to be worth putting a little effort into my apartment layout. I love ‘travel’ but actually dislike ‘travelling’ for the most part (unless it’s a nice train journey) and find the process of moving locations fairly disruptive to my flow.